The Stitchin' Sheep: Nurse, Give Me Two Candies - Stat! Here's Lambchop #2 in his costume. I'm particularly happy with this one, because of the low cost. I was going to use my own white button-down but was lucky enough to find one for 1 euro at the store the other day. It was a strange cut, and nobody else wanted it. Served our purposes quite well, though. I added a red electrical tape cross on his chest with a white electrical tape name tag on the other side, and he was good to go. 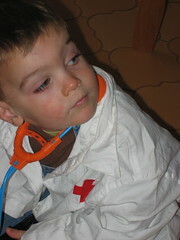 We already had the toy stethoscope, so this was a really easy costume. It actually took me longer to hunt the stethoscope down than to make the costume itself (a very sad statement about the state of our home, indeed).